We're expecting temperatures near 115° today in Tucson. Even I have a tough time getting excited about fiber crafts when it's this hot. 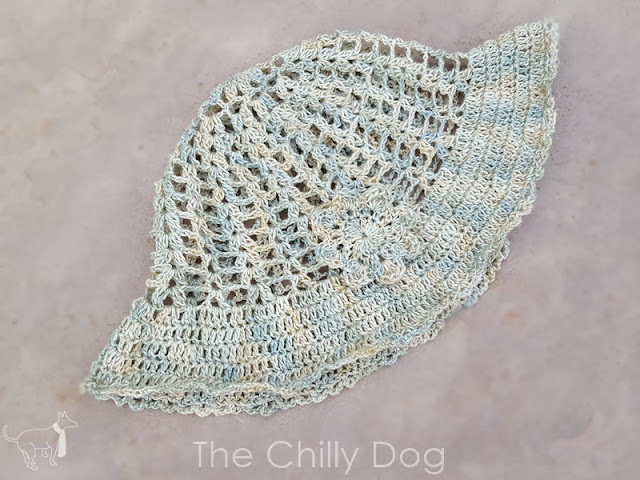 But I have a super cute, hazy daze hat, crochet pattern that I think you are going to love. 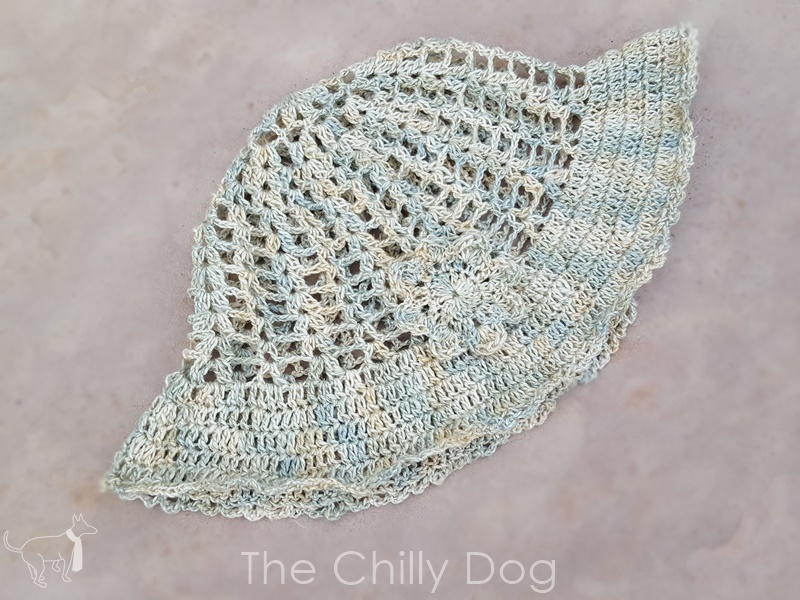 The Hazy Daze Hat is made with a cool cotton, linen, silk and nettle fiber yarn. It's generously sized (22 inches in circumference) so that you can comfortably wear it with a ponytail or hairclip. Cluster (CL) - Holding back the last loop of each dc on hook, 2 dc in same st or sp, YO and draw through all 3 loops. Beginning Cluster Shell (Beg CL Shell) - Ch 3, dc in same st or sp, ch 2, CL in same st or sp. Cluster Shell (CL Shell) - In same st or sp work (CL, ch 2, CL). V-Stitch (V st) - In same st or sp work (dc, ch 2, dc). Ch 8 and join with sl st to form a ring. Rnd 5: Sl st in ch 2 sp, Beg Cl Shell in same sp, [V st in ch 3 sp, Cl Shell in ch 2 sp of next Cl Shell] 11 times, V st in ch 3 sp, sl st in beginning CL. Rnd 6: Sl st in ch 2 sp, Beg CL Shell in same sp, [ch 1, V st in ch 2 sp of next V st, ch 1, CL Shell in ch 2 sp of next CL Shell] 11 times, ch 1, V st in ch 2 sp of next V st, ch 1, sl st in beginning CL. Rnd 7: Sl st in ch 2 sp, Beg CL Shell in same sp, [ch 2, V st in ch 2 sp of next V st, ch 2, CL Shell in ch 2 sp of next CL Shell] 11 times, ch 2, V st in ch 2 sp of next V st, ch 2, sl st in beginning CL. Repeat Rnd 7, seven more times. Rnd 3: Sl st in ch 3 sp, ch 1, sc in same ch 3 sp, [(hdc, dc, 2 tr, dc, hdc) in next ch 3 sp, sc in next ch 3 sp] 7 times, (hdc, dc, 2 tr, dc, hdc) in next ch 3 sp, sl st in 1st sc, fasten off. Attach the flower to the hat and you are ready for some summer fun. 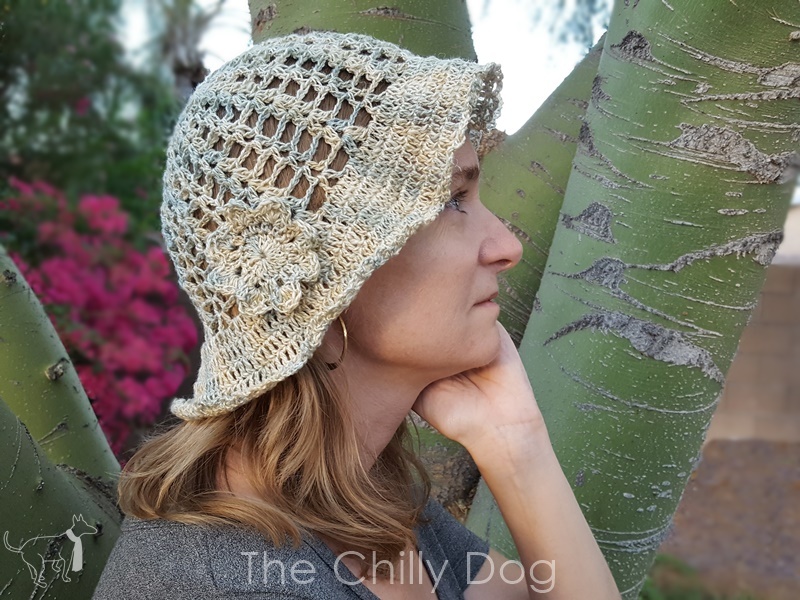 A printable version of this crocheted Hazy Daze Summer Hat pattern with additional sizing options is available in my pattern shop. Stay cool this summer and block the sun with an easy crochet pattern, the Hazy Daze Hat.